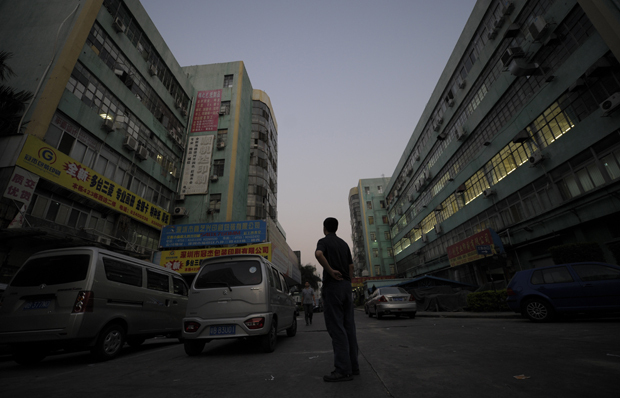 A worker walks near a factory in the southern Chinese city of Shenzhen in 2011. After nearly three decades of rapid urbanization, China’s official and unofficial city dwellers outnumber its farmers. More than 400 million people have already moved into cities in the past thirty years, and in 2011 China crossed the threshold of a predominantly urban society. Today more than fifty-two percent of Chinese citizens live in cities, and by 2025 the government wants that figure to be seventy percent. To achieve this, up to 250 million people will have to move in the next twelve years. China’s urbanization counts as the biggest and fastest social movement in human history, a movement that has turned Chinese society on its head and raises many difficult questions for policy makers. Many of these questions revolve around money. One legacy of earlier times in China is the hukou, a permit held by every Chinese citizen that determines where he or she is domiciled. In Mao Zedong’s time, the hukou tied farmers to the land. In recent decades, those farmers have migrated to China’s cities, seeking work, many of them in the construction boom. But with no right of abode they are locked into the status of a disadvantaged underclass, allowed to work in cities but not to enjoy the right of residence that would give them and their families access to health or education. This system gives the cities the benefit of cheap labor with few of the associated costs, but it is widely recognized as unfair and in urgent need of reform. It makes for a precarious life for migrant workers, who often leave parents and children behind while they work in town for the higher cash wages that farming denies them. If China’s new city dwellers are to become the consuming middle classes that China wants in its next stage of development, they will need the same privileges as existing urbanites, but who will pay? Most of China’s local towns and cities have too little in the way of tax revenue and have financed themselves in recent decades by requisitioning agricultural land for development into industrial, residential, or commercial buildings. This has left a worrying debt overhang for many local authorities, and further urbanization will demand reform of local government finance. This model of financing has created other problems: it has swallowed up precious farmland and created sprawling cities whose inhabitants depend on cars and buses to get around. This means long commutes for workers and rapidly climbing carbon emissions, as well as the choking pollution and congestion that bedevils many Chinese cities. Essential urban infrastructure has sometimes been neglected and many of China’s major cities lack such basics as adequate sewerage systems, that will cope with future expansion and the uncertainties of climate change. What kind of cities will China build in the next decade to house the further 250 million city dwellers planned for 2025? Will that be ten new cities of 25 million inhabitants? Three new mega-cities of 70 million? Or 100 smaller cities of 2.5 million? How will these people live? How will they earn their living? How far will they commute each day? Will they live in energy efficient buildings? Will their new homes have enough water to cope with urban life and will the waste they generate be recycled? The design of China’s future cities will not only affect the health and well being of their residents; it will also be an important factor in the battle to contain China’s soaring carbon emissions. These questions, therefore, are of high importance to all of humanity. If China is to become the sustainable society envisaged in the Twelfth Five Year Plan, it would be wise to look for models in such cities as Copenhagen, rather than such outdated models as Los Angeles. If China does reach its urbanization target, it will be a very different society in just twelve years. Few societies have undergone such rapid upheaval without consequences and the impacts in China will extend beyond the short-term social and economic shifts. In the past five years, China's urban middle classes have become vocal in defense of their property interests and in their desire for a less stressful, less polluted environment in which to bring up their children. Their demands for clean air, safe water, and protection against noxious chemical plants have spilled over into complaints about lack of accountability and transparency in government. They are insisting on a greater role in the decision-making and the planning that affects their lives. Prime minister Li Keqiang has put urbanization at the heart of China’s economic and social agenda as the country aims to become a modestly prosperous, more sustainable society. As China slows down its breakneck pace of growth, middle-class city dwellers will move into higher value occupations and become consumers. They will also demand a better quality of life. The decisions that China’s planners make today will determine whether those hopes are fulfilled. —This article is part of a special report on urbanization produced by chinadialogue, available in the Reports Section.